Now is the time for every enterprise to understand how they'll be affected by the move from IPv4 to IPv6. The impact will vary from one organization to another, and there'll be important differences among functions and operations even within each enterprise. 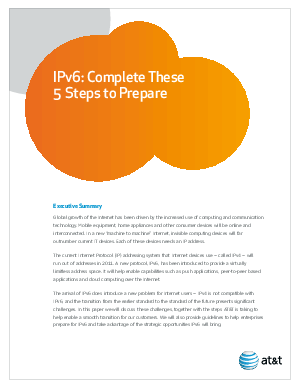 This paper provides guidelines to help you take advantage of the strategic opportunities IPv6 will bring, while avoiding loss of business, marketing challenges, increased SPAM activity and other potential problems. Enterprises should closely examine operations, products and infrastructure, as well as methods for communicating with customers and suppliers, to understand the complexity of the transition. Now is the time to ensure that the network edge is ready for IPv6 - with dual stack, tunneling or full conversion to IPv6. Enterprises should also be communicating with suppliers and content providers to verify their ability to deal with the change and keep networking data moving.